Fiat Chairman John Elkann, left, and CEO Sergio Marchionne during Saturday's meeting with Italy's prime minister, Silvio Berlusconi. MILAN, Italy (Bloomberg) -- Fiat SpA chief executive Sergio Marchionne confirmed the Italian carmaker's pledge to spend 20 billion euros ($27 billion) revamping its domestic plants after meeting with Prime Minister Silvio Berlusconi. “Fiat is a multinational which is expanding internationally, but will keep an Italian heart,” Industry Minister Paolo Romani said today after discussing the investment plan with CEO Marchionne and Chairman John Elkann. Romani attended the meeting with Berlusconi and other members of the government. Marchionne, 58, caused a stir in Italy after saying Feb. 4 the Turin-based carmaker and Chrysler Group may “end up looking like one entity,” possibly based in the United States. He later backtracked, saying no decision has been made and the issue would be dealt with no sooner than 2014. Fiat owns a 25 percent stake in Chrysler. “It's evident that the positive evolution of Fiat's plan for Italy will condition the decision on” the location of its headquarters, Turin Mayor Sergio Chiamparino said today after attending the meeting. Fiat plans to build as many as 280,000 cars and SUVs a year under the Jeep and Alfa Romeo brands at its Mirafiori plant in Italy, starting in 2012 as part of its alliance with Chrysler. Under an accord with unions, workers will put in more hours, take shorter breaks and risk having pay withheld for persistent absenteeism. The Mirafiori agreement is part of a project to revamp Fiat's five Italian car plants, where the company aims to raise annual production to 1.4 million vehicles by 2014 from 650,000 in 2009. Marchionne will also discuss those goals at a parliamentary hearing in Rome on Feb. 15. 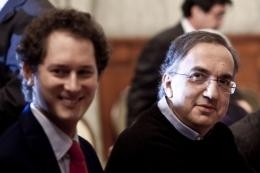 “Marchionne and Chairman John Elkann confirmed Fiat's and Fiat Industrial SpA's intention to invest 20 billion euros in Italy,” the prime minister's office said in a statement today. Fiat aims to improve productivity and capacity utilization to restore profitability in Italy, still its main market. None of the company's earnings came from Italy in 2010, Marchionne has said. The automaker may lose 814 million euros in Europe in 2011, according to Kristina Church, a London-based analyst at Barclays Capital. Fiat can gain a further 10 percent stake in Chrysler in two steps if the U.S. carmaker reaches milestones including some sales goals outside of North America. Fiat has an option to raise its holding to 51 percent, a level Marchionne has said he aims to reach before the end of this year, after Chrysler repays U.S. and Canadian government loans and begins an initial public offering.